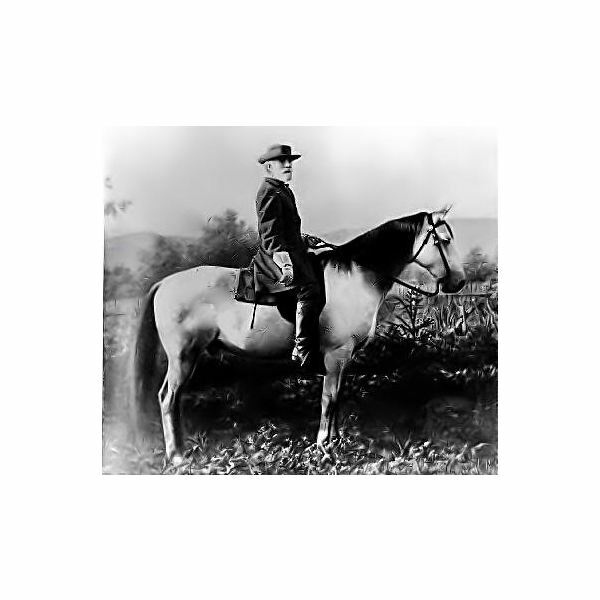 Lesson Plan on Robert E. Lee: Should He Have Been Put on Trial? General Robert E. Lee stands out as a heroic, but defeated, military leader. He nearly led his Confederate Army to victory. He fought bravely, but his rebel army was overwhelmed by the superior forces of the United States Government. Should General Lee have been tried for treason? Many of the Confederacy’s military leaders, including Lee, were Union officers at the beginning of the Civil War. Robert E. Lee could have become the Union’s top officer and helped to put down the rebellion, but instead he chose to fight for the Confederacy. This lesson plan will encourage students to examine the moral and legal implications involved in Lee’s decision to rebel against the United States. Students will critically examine whether Lee and other Confederate generals should have been put on trial for treason against the United States. Understand the factors in Robert E. Lee’s personal and military background that led to his decision to fight against the United States. Understand how the U.S. Constitution defines treason and why treason is the only crime defined in our founding document. Judge whether Lee should have been put on trial for treason. Understand the difficulty of the choice Lee and his fellow Southern officers had to make. Judge whether or not the choice to take up arms against the United States was, in the context of the times, justified. Understand why Lee and others were never charged nor tried. Weigh the consequences of full Southern amnesty against the need to uphold the law. Have students read a short biography of Robert E. Lee before class begins. 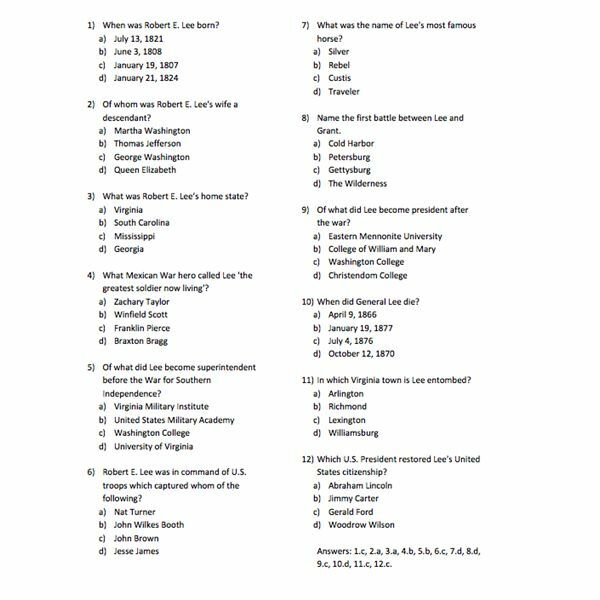 A 15-question optional multiple choice take-home quiz is included at the bottom of this section. a. Fight against the rebellion as some did? Why? b. Fight for the Confederacy as most did? Why? How many students believe Robert E. Lee should have been put on trial for treason? Why or why not? How many students believe Robert E. Lee was guilty of treason? If found guilty, what should have been his punishment? Did he deserve to be pardoned? 1. An essay assignment based on the poll questions above. If the grand jury decides to indict Robert E. Lee, have the remainder of the class listen to arguments for the defense (either by the teacher or a panel of students). 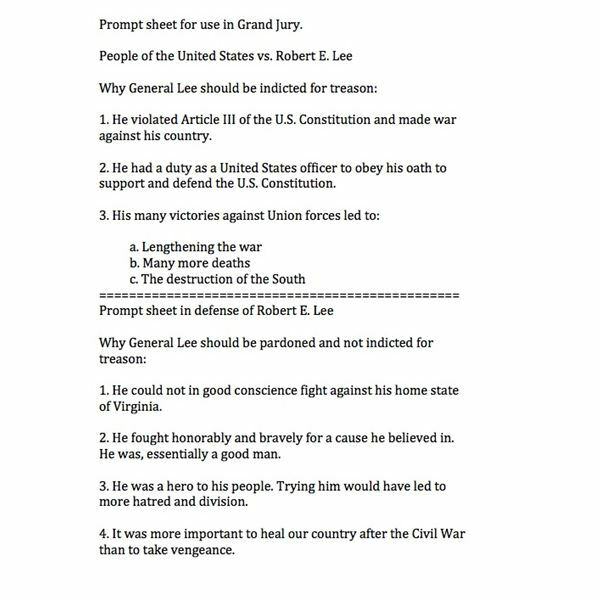 Since the class has already heard arguments that led to the indictment of General Lee, the teacher should ask the class to consider these arguments as having been presented during the course of a “real" trial. After “trial” arguments either take a vote or assign an essay where the student votes “guilty” or “not guilty” and states the reasons. Use these lesson plans to enrich your students’ understanding of America’s greatest conflict. Students will research, collaborate and critically examine the political, cultural, social and moral issues underlying the US Civil War. US Civil War Lesson Plan: Should Robert E. Lee Have Been Tried for Sedition? Civil War Lesson Plan: Confederate VP Alexander Stephens' "Cornerstone Speech"